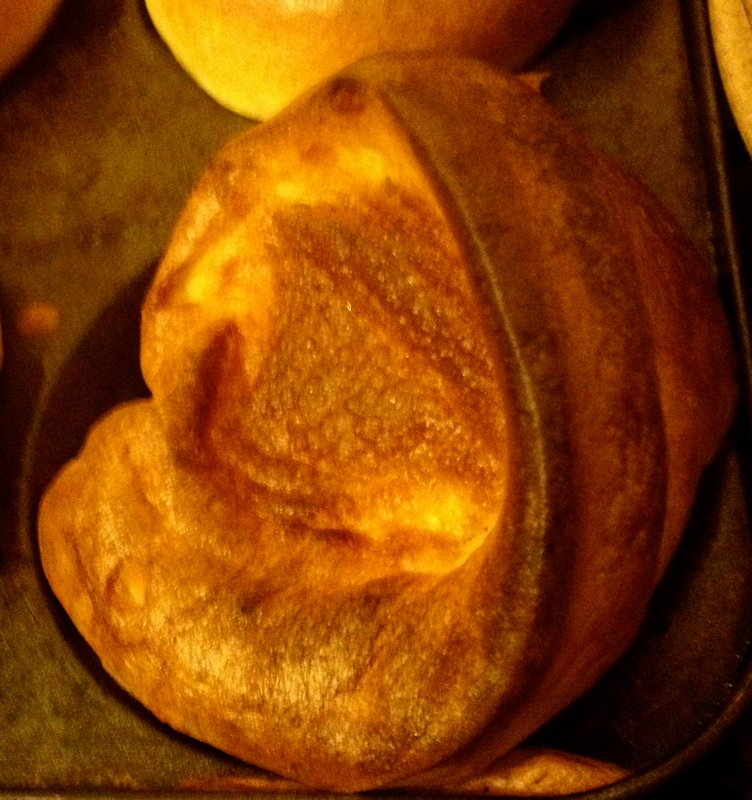 Oh…that quintessential English delight…Yorkshire pudding! It’s said to have it’s origins from a very humble beginning…cooks of the North of England used to collect the fat from roasting joints of meat and used this fat to cook a batter in with the resultant pudding becoming known as “Dripping Pudding”. The first recorded name of “Yorkshire Pudding”, however, using a similar cooking method was found in 1747 in a publication called ‘The Art of Cookery Made Plain and Simple’ by Hannah Glasse. Preheat the oven to gas mark 6, 200°C electric. Using a 4 portions Yorkshire pudding tray, put 1/2 tsp of cooking oil into each and place in the oven. Allow the oil to heat up and watch for a heat haze to come off it; this will take approximately 10 minutes depending upon your cooker. Dawn: This heat haze resembles a faint bluey-looking, almost steam-like mist rising from the cooking oil. Meanwhile, make the batter. Sift the flour and salt into a bowl. Make a well in the centre and crack the egg into this well along with the milk. Beat with a hand whisk until smooth. Pour the batter carefully and in equal amounts into each Yorkshire pudding hole. Dawn: The skill of making great Yorkshire puddings is to ensure the fat is hot enough before adding the batter mixture. My best tip to ensure you make buoyant, bouncy beauties is to leave the pudding tray in the oven right up until the very moment you are ready to add the batter. The success of a Yorkshire pudding is very much in the cooking oil being hot enough to help the batter rise. Place the pudding tray back in the hot oven and cook for a 20-25 minutes or until theYorkshire puddings have risen, looking all puffed-up and golden in colour. Serve with lots of vegetables and onion gravy, the recipe for which is here: Bangers and Mash with Onion Gravy. Dawn: Hannah Glasse re-invented and renamed the original “Dripping Pudding” which had been made in England for many centuries previously and which was a far flatter looking dish than what we have become accustomed to nowadays with its fluffy and light appearance. Used very much as a staple addition to our all-time-favourite meal, the classic Sunday roast dinner, in some cases the Yorkshire pudding was and still is eaten as a seperate course prior to the main course and mainly in parts of Yorkshire today. 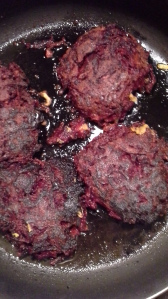 Served with the juicy gravy made from the remainder of the roast meat fat, this is still is a tasty first course today. In days gone by, in less well-off households, the Yorkshire pudding was the only food served as it was inexpensive to make and served to fill its diners at very little cost. For a variation on this great British classic recipe, why not try Toad in the Hole? 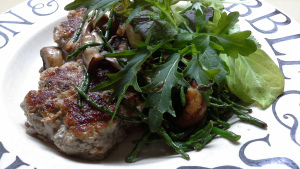 For many more recipes from the Cooking Dynamo, take a mooch through this food blog – www.forfoodlovers.wordpress.com – and also follow the Twitter feed for lively banter, tips and updates @Love_Food_UK.